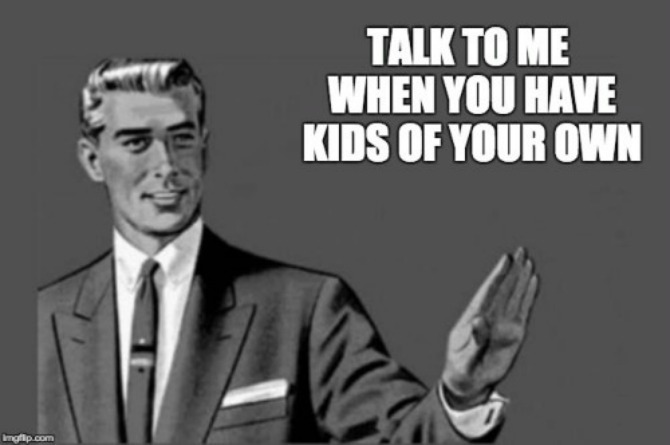 Earlier this week, The Huffington Post published an article that lists five of the most annoying things that people without kids say to people who have kids. After reading and laughing uproariously at the absurdity of the list, we knew we had to bring this topic to attention. Quite frankly, our staff here at The IndusParent could not agree more with the comedy surrounding these outrageous statements. 1. When I have kids, I’ll never let them [fill in the blank]. Well, when you have kids you can open your mouth. Until then, you're just living the age old adage 'easier said than done.' When it's your time to shine as a parent, you'll see just how difficult it is! 2. I’m totally broke, I went to three weddings in the last few months. You can literally replace 'wedding' with anything under the sun and I promise you it's still not even a comparison to the financial worries a parent will have. Until you become a mum or dad, your monetary problems are apples to oranges, my friend. 3. I am so busy, I have no free time. Yes, yes. You must be so busy. I've got news for you: everyone has a job or task that causes a struggle to find free time. Until you know what it's like to live your life while simultaneously raising a child, you should just bite your tongue. I'm guaranteeing you that you have more free time than most parents. 4. *Yawn* I am SO tired. The very definition of "tired" should be changed in the dictionary. Upon finding it in the big book of words, it should read, "Tired: (see parenting)." There's no doubt that most adults don't get all the sleep that they want or desire but parents have it the worst. They're required to be ready and alert whenever needed. Even if that means waking up at 2:47AM to change a diaper. 5. I know exactly what you mean, I have a puppy. Okay, so having a puppy and a baby are similar in maybe three or four ways. After that, there's no comparison. It would literally be the equivalent of saying, "Oh, you're a chef at a five star restaurant? I feel your pain. I grilled chicken last night." It's just not the same, folks! New dad Riteish Deshmukh has a very important message for all Indian parents! Why did Prince William miss Princess Charlotte’s first Easter?